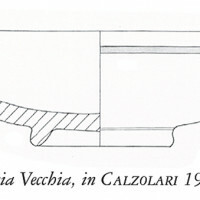 The desire to create a general typology of the ceramics produced locally in ‘Etruria Padana’ came out of the need to for systematic study the ceramics from the excavation of the ancient Etruscan town of Marzabotto (Bologna), abandoning the previous approach of sub-dividing materials according to the individual areas of excavation. Once the type was established, we carried out a comprehensive analysis of the ceramic forms found, with the intention of determining whether such production was sufficiently homogeneous to allow us to define "Etruscan regional production”. At the same time, particular attention was paid to anomalies and morphological differences in order to ascertain the existence of local characteristics, exclusive to certain territories. The systematic study of ceramics is certainly one of the most evident indicators of the cohesion and the acculturation of both a specific community and of entire territories. Not only is it able to highlight particular organization techniques but it can also define specific social structures. The research carried out on the production of ceramics in a particular territory becomes essential when one starts systematically studying the archeological material recovered in a particular area. In fact, the need to create a general typology of Etruscan ceramics from the Po valley area became apparent following the excavation of the Casa 1, Insula 2 and Regio IV in the Etruscan city of Marzabotto (Govi, Sassatelli 2010), first carried out in 1988. The ceramics belonging to the entire Po valley needed to be classified both on a formal level as well as in regards to terminology, going beyond the previous sectorial vision of the study of materials that, until then, had been strictly limited to single areas of excavation. The typological work on this ceramic production came out of a careful review of all the ceramic material discovered in the different archaeological sites of the Po valley, compiling about 4500 scanned items. Over time, this archive was widened to include the data from the excavations in the Etruscan city of Marzabotto. The database was greatly enhanced as the excavations advanced and as subsequent studies on sets of materials previously excavated were carried out, thanks to the work of the University of Bologna. Therefore, the main database of the Po valley ceramics reached a total number of 23,031 records, becoming the most comprehensive archive that has ever been created. Lastly, three additional Etruscan sites completed the computerized database: the necropoli of Certosa and De Luca in Bologna and the sanctuary of Villa Cassarini which was the acropolis of Bologna (the necropolis of Certosa in Bologna was studied by Elisabetta Govi as part of her PhD; the necropolis of De Luca was studied by Giulia Morpurgo in her doctoral thesis and the complex of Villa Cassarini was studied by Silvia Romagnoli and is in the final stages of being published). Considering all these materials, the database of Etruscan ceramics produced in the Po valley, which was then used for the typological classification, has reached about 30,000 entries, a sufficient amount in order to gain fair statistical knowledge on the production of ceramics specific to this area. 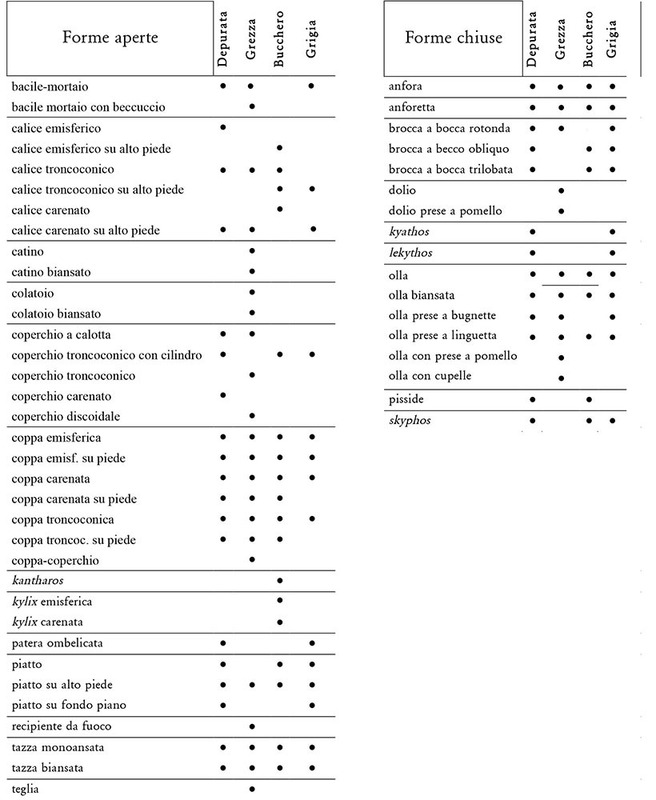 This typological classification (Mattioli, 2013) has never claimed or presumed to be an exhaustive and definitive work; on the contrary it should be seen as an important first step towards a study in fieri. A typology study of ceramic materials, in fact, if it is to be considered a useful tool for archaeological work and analysis, needs to be unceasingly “tested” to prove the validity of the reference system. It is therefore essential for this kind of study to be updated continuously, taking into account both new publications as well as new archaeological discoveries. For all the reasons listed above, we decided to give this typology an open structure, thus leaving space for the addition of new ceramic forms, types, subtypes or variants, if need be, in order for this study to represent the actual typology of the material from the Po valley as accurately as possible. An essential part of the study was also to define precise chronological limits for the first appearance in the Po valley territory of these local ceramics and for the end of its production. It can be hypothesized with a good degree of certainty that by the middle of the VI century B.C. this type of ceramic production was present in the entire Etruria Padana territory, comprehensively and extensively. The beginning of this production, therefore, coincides perfectly with all the events that were to drastically change the political, economic and territorial situation of the Po valley. Indeed, it is precisely during the middle of the VI century B.C. that new Etruscan centers started to appear in the territory with a characteristic uniformity, in line with the start of the local ceramic production prospering together with these new settlements. The study revealed that the Etruscan ceramics from the Padana area fall into four different production types: fine pottery, impasto pottery (grezza), gray fine pottery and bucchero pottery. Identifying the chronological limit that marks the end of the production of the Etruscan ceramics in the Po valley was more complicated than defining the beginning of its production. The Gallic presence, which marks the end of the local Etruscan ceramic production, was not consistent throughout the entire territory. In addition, the phenomena of coexistence between the two peoples in the area, such as in the case of Monterenzio in the province of Bologna, must be taken into account. Another very important aspect of this study is the establishment of the terminology that is to be used when referring to these unique types of pottery production, the creation of a kind of lexicon, defining the name of the pottery forms found in the Po valley and naming the different components (Fig. 1 and Fig. 2). Starting with the types of ceramic production, we decided to use terminological choices that are very simple and immediate. Etruscan ceramic production was then divided, based on the composition of the clay used and the firing techniques, into the following four classes: “fine pottery” refers to purified clay, with or without painted decorations; “impasto pottery (grezza)” refers to non-purified clay; “bucchero pottery” has a distinctive glossy black surface; and finally “fine grey pottery”. The choice of terms used to define the pottery shapes followed three basic criteria: avoid the use of terms referring to the presumed function of particular vessels in ancient times, such as “vaso a fruttiera” or "fruit bowl", the use of which cannot be ascertained without objective data or non-verifiable sources; avoid using terminology that includes the use of diminutives or augmentatives, for example “ciotolina” or "little-cup" and “scodellona” meaning "large-bowl", because they explicitly and exclusively offer a general idea of the size of the vessel; and lastly to limit the use of Hellenistic terms except of course for the vessels whose shape are of undeniable Greek derivation, for example a skyphos or lekythos. Having completed these fundamental steps, we decided to structure our typological classification, from a methodological point of view, around the morphological and formal attributes of the vessels and to organize it in a precise hierarchy, distinct on several levels starting with the more general aspects of the morphology of the vessels and moving on to the most precise characteristics. Therefore four groups were created: Family and shapes – Types – Subtypes – Variations. When the typology had been defined, we then proceeded to an overall analysis of the ceramic shapes found, with the aim of determining whether this pottery production was characterized by a substantial homogeneity, which would allow us to define it as a "regional Etruscan production", equally distributed throughout the whole territory. At the same time particular attention was paid to the anomalies, the morphological variants, in order to ascertain the existence of local attributes belonging only to certain territorial areas. This analysis started by examining the type of production used. 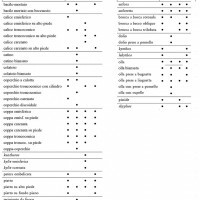 We first attempted to determine whether all the ceramics types recovered in the Po valley and locally produced could be collocated in the four established pottery types (fine pottery, impasto pottery (grezza), fine gray pottery and bucchero pottery) or whether the ceramic production had some specific criteria of differentiation, as in certain types of ceramics were produced exclusively with specific types of clays. Dividing pottery forms into production types lead to the discovery that not all vessels present in Etruria Padana were made using the four productive types which were normally believed to characterize Etruria padana ceramics. Indeed, there are in fact vessels produced in a separate and single class of ceramics, while other pots are produced exclusively with the finest ceramic production methods such as the prized bucchero pottery, or the fine pottery and fine gray pottery (Fig. 3). The study revealed that, at the heart of the Po valley pottery production, there was an evident intent by both the craftsman and the buyer for the vessels to fulfill both their functional role in a household and be representative of the social class that was to own them. We are, therefore, able to say that the Etruscans from the Po valley produced two basic categories of vessels: those for daily food consumption and those dedicated to the storage and preparation of food. The choice of the clay for the production of a specific vessel, the ceramic classification of a particular pot, depended not only on the practical function that the vessel had in daily life, but also on a desire to distinguish the ceramic production in terms of quality. Thanks to this typological study of all the ceramic material recovered, an even more detailed picture of Etruscan pottery started to emerge. Indeed, we have been able to demonstrate that among the forms produced using all four types of production, the bowls and “olle” pots turned out to be, in quantitive terms, the most numerous families of vessels found throughout the Etruscan Padana valley. The bowls and the pots are, in fact, the most widely used forms of ceramics for daily life. The shape of the bowls suggests they were probably used to eat and drink, while the shape of the pots, in particular those of medium and large size, suggests these were more likely utilized for storage and, in some areas, even to cook food. Smaller size pots and especially those made from purified clay, bucchero or purified grey-coloured clay, were most probably used as drinking vessels (glasses). In addition, the relative distribution of the types of ceramics pots and bowls in relation to the categories and shapes of the vessels, reveals that there are no given types, subtypes or unique variations specific to one geographical area over another; therefore we can assert that these two shapes of pottery represent a ceramic production that was commonly used throughout the whole Po valley. We have also been able to establish that there are pottery shapes in use in the Po valley, such as the cover with an internal ring (Mattioli 2013, p. 92), the disc (Mattioli 2013, pp. 212-220), stemmed disc (Mattioli 2013, pp. 221-226), the pitcher with an oblique mouth (Mattioli 2013, pp. 278-281), the pitcher with a trefoil mouth (Mattioli 2013, pp. 282-284) and the amphora (Mattioli 2013, pp. 255-261), which were exclusively produced using the three ceramic types considered the most sophisticated, which were fine pottery, bucchero pottery and fine gray pottery. Furthermore, the predominance of the production of these shapes in fine pottery rather than the other two (bucchero pottery and fine gray pottery) more refined classes is evident. Fine pottery was, in fact, certainly considered to be a more refined ceramic than the impasto pottery (grezza), but was at the same time a more "common" class of ceramics in relation to bucchero pottery and fine gray pottery, most likely because, in the whole Po valley, the production techniques had by this time reached a high enough technical and technological level to enable the mass production of fine pottery throughout the whole territory. The choice to produce some of these shapes also in bucchero pottery and fine gray pottery reveals, most likely, the desire to distinguish the vessels qualitatively thus assigning greater prestige and a specific role in setting the table. It was very interesting to highlight the presence of vase forms produced exclusively in "bucchero pottery" and "fine gray pottery ", in the two ceramic classes considered to be more refined. These vessels are: the stemmed calyx “troncoconico” (Mattioli 2013, pp. 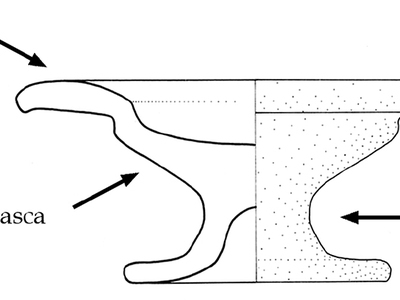 70-71), the calyx “carenato” (Mattioli 2013, p. 71) and the kylix “carenata” (Mattioli 2013, pp. 202-203). Among the ceramic forms found in Etruria Padana there are also those made using only one ceramic production type, for example the hemispherical calyx (Mattioli 2013, p. 68) or the calyx “carenato” (Mattioli 2013, p. 71), found only in fine pottery. Instead, the stemmed hemispherical calyx (Mattioli 2013, p. 68) and the hemispherical kylix (Mattioli 2013, p. 201) are made exclusively in bucchero pottery. In this specific case, it is useful to point out that among the vase forms made only in bucchero pottery there are vessels which, more than others, morphologically evoke an apparent formal conservatism related to older models, whose function was exclusively for the table. In the cases above, it is clearly evident that the choice of a ceramic production method was always made in close relation to the function and the use these vessels had to perform in everyday life. 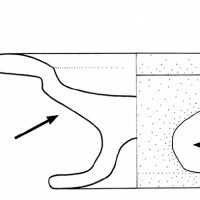 Having established that the vase forms in the ceramics from the Po valley were made using certain ceramics production types according to their function, their daily use and the prestige that they had to have, we then moved on to analyzing their topographical distribution in order to verify the presence of local peculiarities. For this purpose the main forms were divided into three major groups based on their presumed use in ancient times: sets of the main vessels used for dining, for food preparation and for storage. In conclusion, as a result of this typological study extended to the entire Po valley, it has been demonstrated that the ceramic pottery produced locally should be considered as a massive and large production standardized throughout the whole territory for over two centuries. However, it is undeniable that, despite the substantial homogeneity of the whole production, it was possible to identify in some cases, certain local features, specifically created to distinguish the particularities of each area. On the basis of this study, the ceramic material produced in the Po valley represents a highly informative reference point covering more than two centuries and thus becoming a true cultural indicator that allows us to understand the level of technical and technological knowledge acquired by local craftsmen as well as the rules related to the preparation and consumption of food in this specific area and period. Govi Elisabetta and Giuseppe Sassatelli, eds. 2010. Marzabotto. La Casa 1 della Regio IV – Insula 2. Bologna: Ante Quem. Mattioli, Chiara. 2013, Atlante tipologico delle forme ceramiche di produzione locale in Etruria padana. Bologna: Ante Quem. Chiara Mattioli 2016, ‘The potential of the typological study of ceramics. The example of “Etruria Padana”’, in Groma 1. doi: 10.12977/groma4.